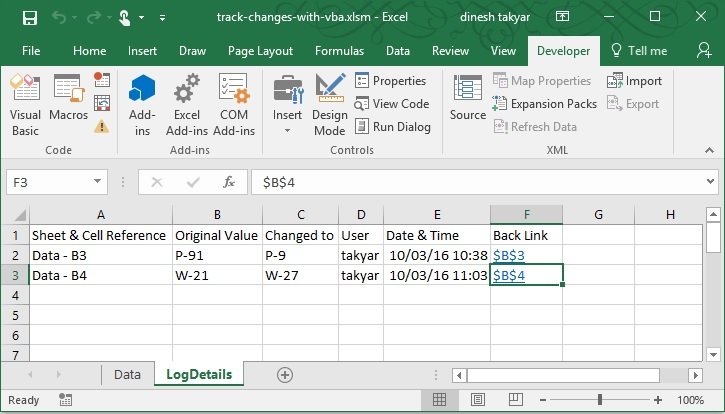 We can track changes automatically in an Excel worksheet with VBA. We capture the sheet and cell address where the change is made, the old or original value, the changed value, the name of the person who made the change, the date and time the change was made and a back-link to the changed cell address is also created. I would like to track all changes made to all of my worksheets and I tried your suggestion because I was having issues with the hyperlink. When I changed it, my macro now breaks at that line. Any ideas why? and thank you too Torben! I keep getting this issue then the macro will work for a handful of changes then it stops and I can’t get the macro to work again, I have to use an old version of my workbook and copy and paste it back into it to get it to work to try to fix the issue but due to my limited knowledge have been unsuccessful. I tried copying and pasting the code above in to help but that stopped the macro working too. Please can someone help? Just like the other friends that have posted comments, I too am very grateful to you for the videos you publish. Your tutorial is executed excellently, So, thank you again! PS: I’m researching how to resolve ‘Subscript out of range (Error 9)’ problem and hope to share with others as soon as I figure it out. Like most coding errors, I’m sure it’s something silly. but i am facing similar problem like DAmil. Hi Dinesh, Thank you for making this available, it is fantastic. Is there a code to add to this to ignore a specific worksheet in the workbook from tracked changes? Is there a way to show changes to cell formulas in the Log Details Original Value and Change To columns? This would be very helpful for my application. If I would like to transfer multiple data from my Userform to the worksheet, I want to have the auto change tracking data in to the LogDetails sheet. The video that you have shared, data changed in the sheet can be tracked once of every data changed in a cell whereas I want to save the multiple data from the userform which will be saved in multiple cells in a worksheet. Would be grateful if you please guide me in this. Great tutorial and work, thanks a lot. What I wanted to ask is, is it possible to log changes in a different workbook, instead of different worksheet in same workbook? I noticed that the ‘Undo’ option isn’t available when using this tracking VBA. Is there anyway so that the ‘Undo’ option is made available? I too have this question. My code is in “ThisWorkbook”, so it should be a defined type. I’ve checked that the sheet name is correct, Googled and tried every suggestion that I came across but the problem persists. Would you happen to know what’s the issue? You have deleted the LogDetails sheet. This sheet is always there even though you cannot see it until you double-click somewhere on the Data sheet. Re-load the sheet from this website and try again without deleting that sheet. Thanks for your comments. I tried again and it’s still the same error. The LogDetails sheet is hidden and I’m unable to call it out by double-click somewhere on the Data sheet. I can run these lines until the next Sheets(“LogDetails”) is encountered. It seems that i always get stuck at Sheets(“LogDetails”). Please check the inverted commas in the code, It seems that there are different inverted commas in the original code, and I copy and paste it. I changed all the inverted commas, and now it works without errors. I tried to use this without the hiding funtions, and at first sight it was awesome, was working immediately in the file where I wanted to apply for. Later on I realized, there is one specific activity, which kills the script: if the user does a multiple selection on the worksheet, where we want to log. Do you have any idea, how would it be possible to solve this? The easiest option would be to block the multiple selection, with some extra line in the code – Until now I have not found any solution. I am getting an compile error called Syntax error for the following in (“A:D”). How do I fix it? The Problem is The inverted commas. If its still not working, write the line yourself , do not copy paste. Don’t copy paste , write the line yourself. when I sent my reply the inverted commas in the second line changed. Awesome post! It’s just what I needed. However, my code is breaking at the hyperlink line. I have tried typing the code myself and copy and pasting the code. Neither fixed it and I cannot find a solution. Any suggestions? Hyper link not working, it shows The syntax of this name isn’t correct.